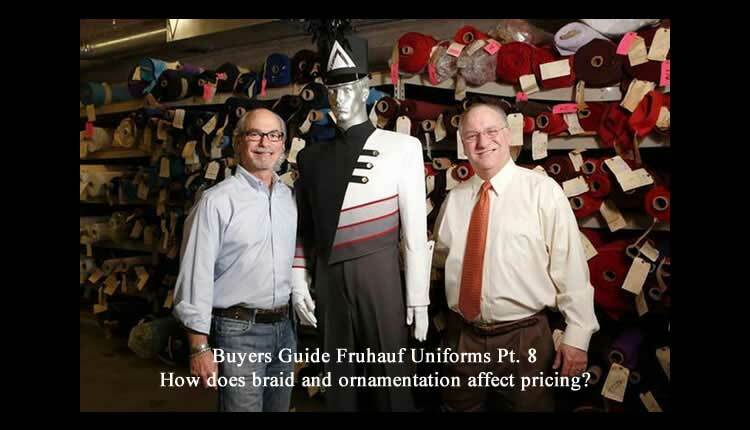 The biggest cost in braid and embroidery is not materials but rather a labor. Remember each uniform manufactured is an “exclusive” for your school. Unlike “civilian manufacturers”, we cannot manufacture several hundred 38R male-charcoal gray band uniforms. Each order is unique and distinctive, and that fact requires intensive “hand work” which translates into added costs. When trying to determine how much ornamentation is correct, consider if the detail will be effective when you view the uniform in actual use. Many ideas that look great from two feet away are lost when you are twenty yards away from the uniform. By viewing a computerized color sketch, and ultimately an exact sample uniform, you will be ableto determine the effectiveness of the trim work.